Every year, the Sociedad Israelita Brasileira (SIBRA) Congregation in Porte Alegre, Brazil, of which I am the President, comes together to celebrate Passover in a communal seder. This year, drawing upon years of the good and deep relationship between both our communities and spiritual leaders, the Archbishop of Porto Alegre, Dom Jaime Spengler, invited SIBRA congregants to hold a demonstration of our seder for his constituents. Our rabbi, Rabbi Guershon Kwasniewski, countered with the following offer: let’s hold a real seder, not a demonstration, on the very date of the holiday’s start, and let’s do it inside the cathedral. It will not be for the priests, but rather for Jewish and even Catholic congregants to participate and attend. And they agreed, responding that it was an excellent idea. 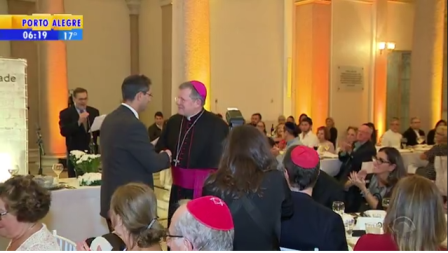 Rabbi Guershon Kwasniewki of Congregation SIBRA shaking hands with Archbishop of Porte Alegre, Dom Jaime Spenger, at their Passover seder in April 2017 on Globo TV. And a brief excerpt here on YouTube. The event was mentioned in the Brazilian Senate and the Brazilian President, Michel Temer, sent a letter to Congregation SIBRA. You can also read the beautiful letter from our regional leadership, Raul Gottleib and Miriam Vasserman in support and recognition of this special event by clicking here. Please fill out this form to share "From the Halls of a Cathedral, Echoes of a Seder: SIBRA Celebrates Passover in Unique Ceremony" via e-mail.